When I returned home from Virginia, I was greeted by this. That's a very fine looking pepper but it's not ripe. It finally ripened over Labor Day weekend. 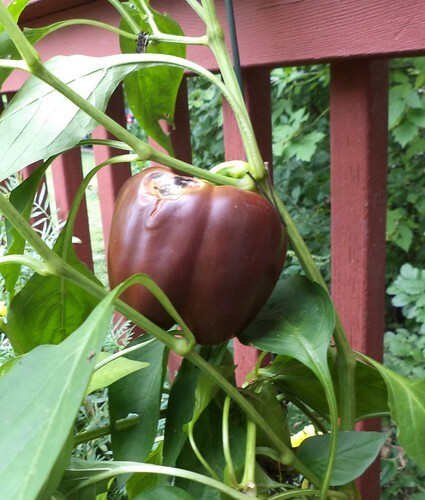 This is what a chocolate pepper looks like when it's ready to be harvested. It's a glossy brown and looks just like chocolate. The banana peppers were also ready. Here are the fruits of the harvest off those two plants. Isn't that lovely? The spot on the side of the chocolate pepper where something nibbled was a bit soft so, when I cut it into slices for eating, I just cut that out. 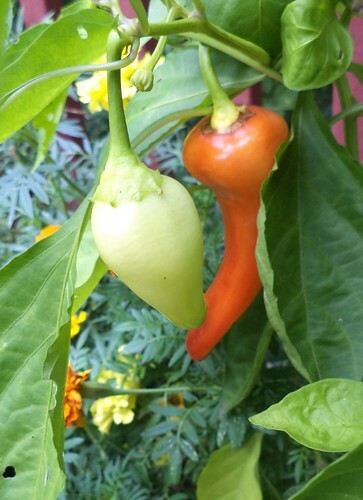 The banana pepper's color change doesn't, I don't think, make the peppers any spicier than if they are harvested when they are the color of ripe bananas. I slice them in half, remove the seeds and eat them raw or with salad dressing for dipping. 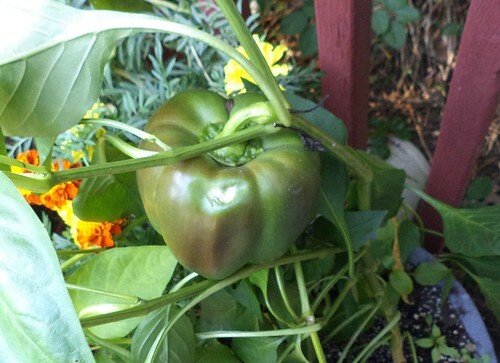 I don't see any more chocolate peppers on the plant so, for $3.49, I got one pepper. Kind of the same return I would get in the store except you don't see chocolate peppers in the store. I'll do this again next year, but I think I will cut back on the number of deck flowers so the peppers have more room to spread in their container. I think I would have had better yields, had I been able to rotate the plants and not worry about where to put all the flowers. 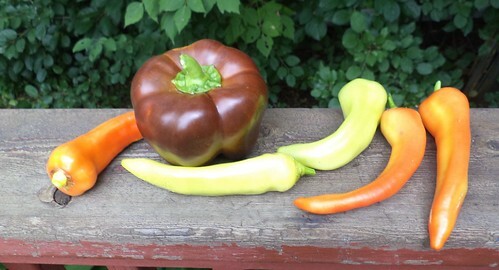 If I'd get my seed system going properly again, I could start my own seeds and have purple and orange peppers. Still, this was an excellent harvest this year. There are yet some small banana peppers on the plant. I will leave it until the first freeze is announced. Who knows how many more I can get.